Jolt your tanning routine with an invigorating and sizzling experience. 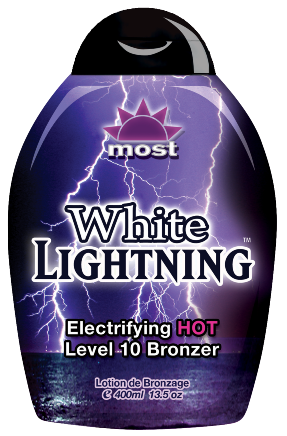 White Lightning is an ultra dark level 10 bronzing lotion with a vivid Hot tingle designed to stimulate your senses like no other. Deep Dark Bronzers with Biotanning Complex provide your body with a remarkably bronze tone. Skin Firming and CoQ10 Cell -renewal complex tighten, tone and rejuvenate skin's appearance for a tan almost as breathtaking as the Hot tingle.